You will need Node and TypeScript installed on your machine. TypeGraphQL is a framework building GraphQL APIs in Node.js. It makes use of TypeScript classes and decorators for defining GraphQL schema and types as well as resolvers. With TypeGraphQL, we don’t need to manually define types in SDL or create interfaces for our GraphQL schema. TypeGraphQL allows us to have only one source of truth, that way reducing field type mismatches, typos etc. Another interesting thing about TypeGraphQL is how well it integrates with decorator-based libraries, like TypeORM, sequelize-typescript or Typegoose. This allows us to define both the GraphQL type and the entity in a single class, so we don’t need to edit multiple files to add or rename some properties. If you have ever worked with TypeScript before (which this tutorial assumes), then you should be familiar with some of the settings above. Since TypeGraphQL makes extensive use of decorators, which are an experimental feature of TypeScript, we need to set both emitDecoratorMetadata and experimentalDecorators as true. Also, we need to add esnext.asynciterable to the list of library files, since graphql-subscription uses AsyncIterator. We define a Project class and use the @ObjectType() decorator to define it as a GraphQL type. The Project type has three fields: id, name and tasks. We use the @Field decorator to define these fields. The @Field decorator can also accept optional arguments. We can pass to it the type the field should be or an object containing other options we want for the field. We explicitly set the type of the id field to be Int while tasks is an array of the type Task (which we’ll create shortly). This is pretty similar to the Project schema. With our schema defined, we can move on to creating the resolvers. We use the @Resolver() decorator to define the class as a resolver, then pass to the decorator that we want it to be of the Project type. Then we create our first query, which is projectByName, using the @Query() decorator. The @Query decorator accepts two arguments: the return type of the query and an object containing other options which we want for the query. In our case, we want the query to return a Project and it can return null as well. The projectByName query accepts a single argument (name of the project), which we can get using the @Arg decorator. Then we use find() on the projects array to find a project by its name and simply return it. Since the Project type has a tasks field, which is a custom field, we need to tell GraphQL how to resolve the field. We can do that using the @FieldResolver() decorator. We are getting the object that contains the result returned from the root or parent field (which will be the project in this case) using the @Root() decorator. We define two queries: fetchTasks and getTask. The fetchTasks simply returns an array of all the tasks that have been created. The getTask query is pretty similar to the projectByName query. Then we define a mutation for marking a task as completed, using the @Mutation. This mutation will also return a Task. Firstly, we get the task that matches the supplied taskId. If we can’t find a match, we simply throw an appropriate error. If the task has already been marked as completed, again, we throw an appropriate error. Otherwise, we set the task completed value to true and lastly return the task. Just as we did with the Project type, we define how we want to resolve the project field. Since we need to build our schema first before making use of it in our GraphQL server, we create an async function, which we call bootstrap() (you can name it however you like). Using the buildSchema() from type-graphql, we pass to it our resolvers and we set emitSchemaFile to true (more on this shortly). Once the schema has been built, we instantiate a new GraphQL server and pass to it the schema. Then we start the server. Lastly, we call bootstrap(). Sometimes, we might need to see or inspect the schema in SDL (Schema Definition Language) that TypeGraphQL will generate for us. One way we can achieve that is setting emitSchemaFile to true at the point of building the schema. This will generate a schema.gql file directly in project’s root directory. Of course, we can customize the path however we want. 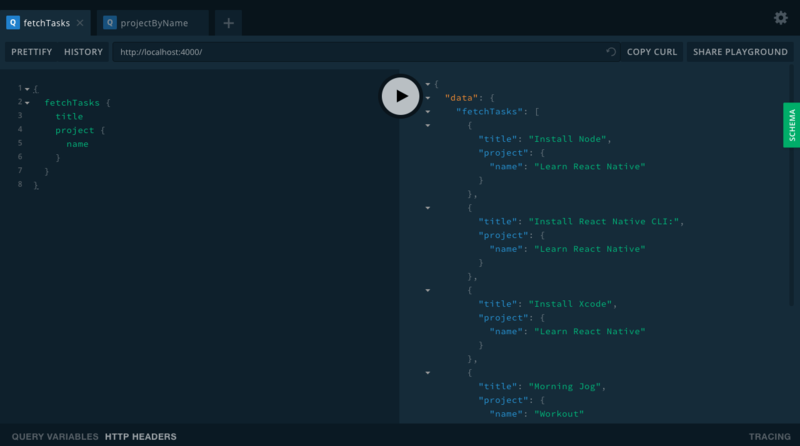 In this tutorial, we looked at what is TypeGraphQL and it makes it easy to work with GraphQL and TypeScript. To learn more about TypeGraphQL and other advanced features it provides, do check out their official website as well as the GitHub repo.